When faced with a life-threatening oxygen shortage, glioblastoma cells can shift gears and morph into blood vessels to ensure the continued supply of nutrients, reports a team led by Inder Verma, Ph.D., in a feature article in this week’s issue of the Proceedings of the National Academy of Sciences. Their study not only explains why cancer treatments that target angiogenesis—the growth of a network of blood vessels that supplies nutrients and oxygen to cancerous tissues—routinely fail in glioblastoma, but the findings may also spur the development of drugs aimed at novel targets. Glioblastoma tumor cells (shown in green) can transform into endothelial cells (shown in red), which line the interior surface of a tumor vessel. To grow beyond one to two millimeters in diameter—roughly the size of a pinhead—tumors need their own independent blood supply. To recruit new vasculature from existing blood vessels, many tumors overexpress growth factors, predominantly vascular endothelial growth factor, or VEGF. This led to the development of Avastin, a monoclonal antibody that intercepts VEGF. “In a recent phase II clinical trial, 60 percent of patients with glioblastoma responded to a combination of Avastin and Irinotecan, which directly interferes with the growth of cancer cells,” explains Verma, “but in most patients this effect was only transient.” In fact, studies have shown that tumor cells often become more aggressive after anti-angiogenic therapy, but the reason had been unclear. To find out, postdoctoral researcher and first author Yasushi Soda, Ph.D., took advantage of a mouse model of glioblastoma that recapitulates the development and progression of human brain tumors that arise naturally. “The tumors in these mice closely resemble glioblastomas, including the typically messy and highly permeable tumor vessels, which allowed us to study the tumor vasculature in great detail,” he explains. The glioblastoma mice, the concept for which was developed in the Verma laboratory, grow brain tumors within a few months of being injected with viruses that carry activated oncogenes and a marker gene that causes all tumor-derived cells to glow green under ultraviolet light. By simply tracking the green glow under the microscope, the Salk researchers can then follow the fate of tumor cells. 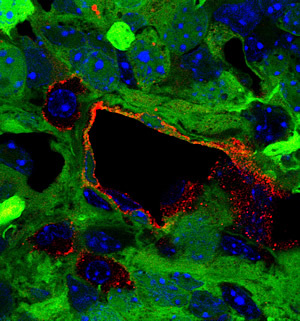 When Soda peered at the tumor cells, he found—much to his surprise—that about 30 percent of vascular endothelial cells—specialized cells that line the interior surface of blood vessels—appeared green. “This indicated to us that they most likely originated from tumor cells,” he says. Further experiments revealed that TDECs, short for tumor-derived endothelial cells, are not specific to mouse tumors but can also be found in clinical samples taken from human glioblastoma patients. “This was really strong evidence for us that glioblastoma cells routinely transdifferentiate into endothelial cells,” he explains. The transformation is triggered by hypoxia, or low oxygen levels, which signals tumor cells that the time has come to start their shape-shifting stunt. But unlike regular vascular endothelial cells, TDECs don’t require VEGF to form functional blood vessels. “This might explain why, despite being initially successful, anti-angiogenic therapy ultimately fails in glioblastomas,” says Verma. Researchers who also contributed to the work include Tomotoshi Marumoto, Dinorah Friedmann-Morvinski, Mie Soda, and Fei Liu at the Salk Institute; Hiroyuki Michiue in the Department of Physiology at the Okayama University Graduate School of Medicine, Dentistry, and Pharmaceutical Sciences; Sandra Pastorino and Santosh Kesari in the Department of Neurosciences, Moore’s Cancer Center, at the University of California, San Diego; as well as Meng Yang and Robert M. Hoffmann at AntiCancer, Inc., San Diego. The work was funded in part by the National Institutes of Health, the Merieux Foundation, the Ellison Medical Foundation, Ipsen/Biomeasure, Sanofi Aventis, the H.N. and Frances C. Berger Foundation, and the James S. McDonnell Foundation.